The rest should be payed upon arrival. failure to cancel the group booking 4 weeks before will mean a loss of the 30% deposit. 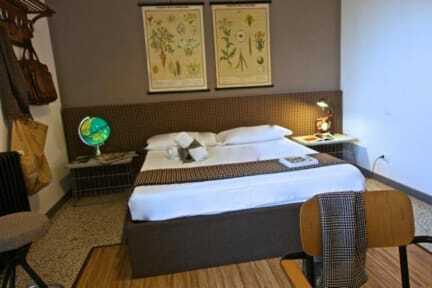 A couple of minutes from the city center of Florence, Tasso Hostel is located in a creative oasis. Between the houses of the local Florentine's, working craftsmen, restaurants, trattorias, wine bars and the eclectic nightlife of the Oltrarno. Tasso Hostel has 13 uniquely designed rooms with excellent service and beautiful accommodations at affordable prices, changing your average hostel stay into a pleasurable and playful experience. 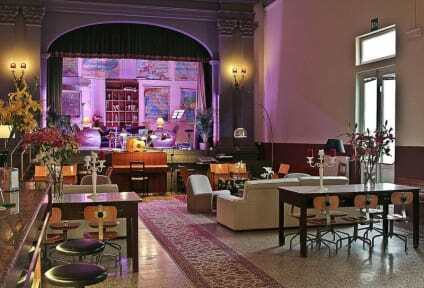 Our hostel features a luxurious and spacious lounge areas, a garden, bar and theater stage. They providing our guests the perfect atmosphere and space to sip a drink, listen to music and meet people from the area and around the world. Tasso hostel believes in promoting its local and international musicians, poets, filmmakers, fashion designers and artists, with an alternative and vibrant space that embraces creative expression along with an exchange of innovative ideas. Every weekend we have PARTIES and heads up they can be quite noisy, so check on our face book page whats going on. (THURSDAY, FRIDAY SATURDAYS & SUNDAYS) guests will have a true Florentine experience, meeting new friends and wanderers at our events, parties, movie nights, poetry readings, markets, live music and laughter will be heard coming from our theater. Here you will be meeting the people who live in the area and wanderers alike. Because " There are no strangers here just friends you haven't met"
At the end of the day when your soul is satisfied and needs to rest, the hostel is equipped with great quality beds, soft cotton linen, clean private showers and toilets. Making your stay as pleasurable as possible. The hostel offers free WIFI, a modern kitchen, laundry room, vending machines, maps and safety lockers to store your valuables. We have our very own travel gurus, multilingual speakers who are all-around nice guys at your service. We are here to assist you with all your crazy activities, museum bookings, tour suggestions, restaurant reservations and the best information on the city, transport and events. Good location, a few miles away from the storic centre, so it was easy for us to find where to park the car (a big car parking in a sqare, just one block away). The overall staying was really good, with all mentioned amenities and a helpful staff. It even has a bar and they gift us a couple of drinks! Tasso was one of the very best hostels I have ever stayed at. I would give it an A+. Walk-able to everything and a extremely great place to come home to after a day discovering Florence. Especially loved the outdoor patio area! I have stayed for 5 nights at Tasso Hostel. It was a bit far from the train station but in a very safe area where you could find easily a bar, grocery store or restaurant. I have really appreciated the fact that i could make my laundry the first day i've arrived after a week in Sorrento! The lounge atmosphere is magic in this old theater! It was the most beautiful place where you could relax at the bar when you are too tired to go out in the evening. The breakfast is included and is very good! Nice, quiet hostel! The showers are the kind where you push the button, they spray for about 8 seconds then go off, so that’s annoying but other than that we enjoyed our stay! Big kitchen, super nice and helpful staff! And our 6 person bed were NOT bunk beds which was amazing! Would definitely recommend. Yummy crossiants for breakfast with yogurt and cereal & coffee! This hostel was nice for the price. The bed was a little uncomfortable and it could have been cleaner, but it was fine. Should be provided blankets. It was really uncomfortable during the night. This hostel was fine for a few nights of sleeping, but I don’t feel like I got a good value for what I paid. The bathrooms were really gross and just not a great atmosphere here. And it’s over a 20 minute walk to anything worth seeing in Florence. I was very unpleased with my stay here. I ended up booking a hotel for the second night. The pictures are not accurate whatsoever. The room felt like a prison cell and there was blood on the curtains. When I arrived, there was no one at reception, it was nearly 2am, as my flight had been delayed. There was a very loud party going on in the main room. After I stood with all of my luggage for 20 min, someone finally helped me. The area was mediocre at best. Would not recommend this place AT ALL.